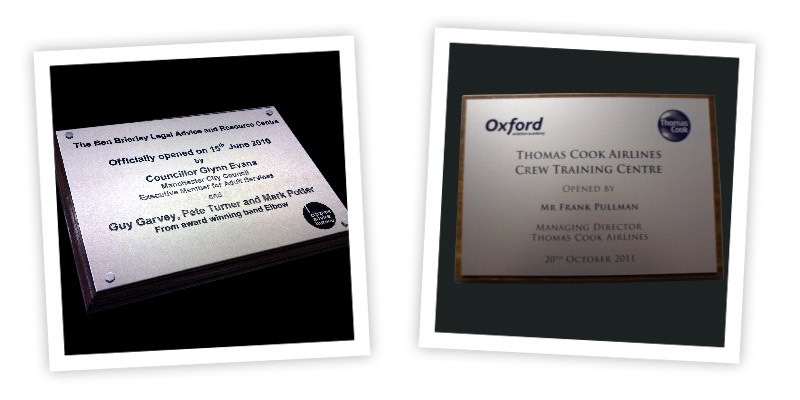 Corporate Plaques – The Manchester Rubber Stamp Co. Ltd.
Corporate Plaques are custom made in-house and come in a wide range of materials, some of the more common choices are 316 polished stainless steel, 316 matt stainless steel, aluminium and brass. We collectively have over 100 years of engraving experience and as such you can rest assured of receving a quality job. We have the full array of Engraving machinery including :-Manual Pantograph Engravers, CNC Engravers and Laser Engraving Machines. We use the latest computer drawing packages to design our plaques and have over 5000 fonts in our own font library. Our drawing packages except most file extensions, some of the more poular file formats being eps, pdf, dxf, plt, etc. When required our plaques come complete with a wooden plinth, or for that modern look stainless steel stand off’s especially for our perspex(acrylic) plaques. Bench plaques and similar come complete with holes or 3M self adhesive. We also have unveiling curtains available for hire if required. Site designed and developed by Siminki - freelance web designer Manchester.